In May 2018, Oboist Professor Nicholas Daniel of the Guildhall School of Music and The Trossingen University of Music visited Newham to see the Every Child a Musician Programme in action. Professor Daniel was delighted to spend the afternoon at Curwen Primary School with Ms Kate Mansfield, Head of School and a group of young keyboard players. He saw the Year 5 children learning in their ECAM music lesson and beginning to prepare for their Step 2 examination. ECAM Tutor Craig Murdoch explained that the children had successfully achieved their Step 1 examination with the Every Child a Musician Programme and the London College of Music Examinations. The children were enthusiastically working on Electronic Keyboards which have been provided free to the school by the Every Child Programme. 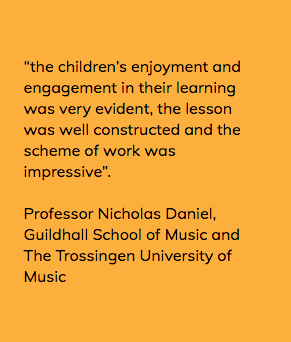 Professor Daniel commented that “the children’s enjoyment and engagement in their learning was very evident, the lesson was well constructed and the scheme of work was impressive”. Every Child a Musician Programme and Professor Daniel were very grateful to Ms Kate Mansfield and the children of Curwen School for successfully highlighting our great partnership in delivering music to Newham’s children.